On April 3, 2014, dissident and prisoner of conscience Dinh Dang Dinh died at his home in Dak Nong province. The former blogger and school teacher, who was terminally ill with stomach cancer, had served more than two years of a six year sentence when he was released from An Phuoc Prison on medical parole on February 15, 2014. 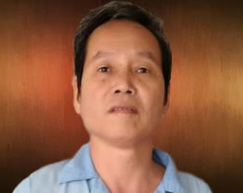 His family has been critical of prison authorities, who they say waited until it was too late before authorizing proper medical treatment for Dinh after he became severely ill.
His death comes less than two weeks after he was notified on March 21 that he had been granted permanent release from prison in a presidential amnesty. Dinh was arrested in 2011 in Dak Nong province after he initiated a petition against a Chinese bauxite mining project in the Central Highlands and called for multi-party pluralism and human rights in Vietnam. He was sentenced to six years in prison under penal code article 88, conducting anti-government propaganda. Even though critically ill, after his release from prison on medical parole in February 2014 he remained outspoken, serving as one of the founding members of the association of Former Vietnamese Prisoners of Conscience. The beloved teacher Dinh Dang Dinh just breathed his last breath and passed away in the loving arms of his family and friends at 9:30 p.m. on April 3, 2014, at his home in Dak Nong province. After more than 2 years of imprisonment in harsh prison condition and lack of medical care, teacher Dinh Dang Dinh died of stomach cancer in final stages at the age of 50. His permanent departure is an infinite grief for the democracy movement in Vietnam for losing his dedication, contributions, and sacrifices for the country. Teacher Dinh Dang Dinh, born in 1963 in Hai Duong, was a former lieutenant of the Vietnam People's Army. Due to his disagreement with the Communist party, he left the army and became a high school chemistry teacher at Le Quy Don High School in Dak Nong. Witnessing the destruction of the Bauxite Project, teacher Dinh dang Dinh had actively called on local residents to sign a protest against this polluting project. His activism drew the support from many local residents and also made him a target of harassment from the authorities. Then he continued to publish many articles expressing his dissent with the leadership of the Communist party. He strongly urged for democracy, political pluralism and human rights for the people of Vietnam. In October 2011, teacher Dinh Dang Dinh was arrested for allegedly "conducting propaganda against the State" under Article 88 of the Penal Code. A year later, the Dak Nong provincial court sentenced him to 6 years in prison. Suffering stomach cancer and the harsh prison condition while serving his jail term, his health had badly depleted. Although his family had repeatedly requested the prison to take him to a hospital for treatment, prison officials had deliberately delayed an approval for him to seek the treatment he seriously needed. At the end of 2013, when his health had become extremely bad, teacher Dinh Dang Dinh was taken to a hospital to have 3/4 of his stomach removed. Even though when his health was not recovered after the surgery and he still suffered a lot of pains, teacher Dinh was immediately taken back to the prison. After returning to the prison, his health had become increasingly depleted while the prison deliberately ignored the cries from his family. In early 2014, prison police took him back to Saigon for another treatment; however, the cancer then was in the final stages and no longer curable. Talking to the journalist Truong Minh Duc, the teacher said when he discovered blood in his bowel movement he requested going to a hospital for an examination but the prison wardens beat him instead of considering his request. On March 21, 2014, teacher Dinh Dang Dinh received an “amnesty” from President Truong Tan Sang when he was so close to his death. Reportedly, the amnesty was granted for the purpose of "meeting the requirements of domestic and foreign affairs of the state." Sharing his thought with VOA after receiving the amnesty, the teacher said: "This order does not bring anything valuable anymore because I am going to lose all of my physical strength." "No mercy, no humanitarian whatsoever. For those who are concerned, please pay attention to the common objective which is the struggle against the dictatorship of the Communist regime. I personally do not have anything left to be cared for anymore." After learning that he would not survive, teacher Dinh Dang Dinh expressed his will to be taken back to his home in Dak Nong for spending the little time left to live under the old roof aside relatives and neighbors and to die in the arms of his loved ones. On April 03, 2014, just a few hours before his death, the Redemptorist Order priest Anton Le Ngoc Thanh had come to teacher Dinh’s home in Dak Nong to perform a baptism ceremony for him; the teacher chose Peter for his baptized name. Amnesty International has paid tribute to Dinh Dang Dinh, the Vietnamese environmental activist, blogger and former prisoner of conscience, who has died aged 50. The activist was unjustly jailed in 2011 after starting a petition against a mining project and was diagnosed with cancer while in prison. The authorities only allowed Dinh Dang Dinh to be treated in hospital from January 2014, where he was kept under constant surveillance. He was released temporarily on medical grounds in February, before being released permanently in March. Dinh Dang Dinh died of stomach cancer at his home in Dak Nong province in Viet Nam’s Central Highlands yesterday evening. “We join human rights defenders in Viet Nam and across the world in mourning the loss of Dinh Dang Dinh and express our deepest condolences to his family,” said Rupert Abbott, Amnesty International’s Deputy Asia-Pacific Director. A former soldier and chemistry teacher, Dinh Dang Dinh was arrested in December 2011 after he had initiated a petition against bauxite mining in the Central Highlands. He was sentenced to six years in jail in August 2012 for “conducting propaganda against the state”. His trial lasted just three hours, before an unsuccessful appeal hearing was over in 45 minutes. His right to liberty was thus denied in proceedings that were as unfair and arbitrary as the charges against him. On leaving the appeals court, he was manhandled into a truck and security officials beat him over the head with clubs. Scores of others remain imprisoned for speaking out in Viet Nam, with some prisoners of conscience locked up in harsh conditions for many years. Danlambao - Thầy giáo Đinh Đăng Định vừa trút hơi thở cuối cùng trong vòng tay gia đình và bạn bè vào lúc 21 giờ 30 phút, tối ngày 3/4/2014 tại nhà riêng thuộc tỉnh Đăk Nông.